Rakusan did not include the Fan Series in his main sequence numbering. Therefore, the original number used for each of the 36 Series prints has been modified to identify the Fan Series members of its theme. The five different fan silhouette shapes have been here assigned arbitrary numbers 1 through 5. To indicate a fan design these shape designations are added to the 36 Series number separated by a hyphen. 128-2 is the Fan Series design with fan shape 2 in the 128 Japanese Iris theme. Like all other designs in this series, 128-2 was only produced in a single print run, and few copies are currently documented. The 128 Japanese Iris theme is one of the many entirely regular themes represented by a complete fan quintet and a color woodblock print. The Fan Series prints of the 128 Japanese Iris theme were distributed in early 1935 in installment ten (of twelve), but the delivery documents for installment ten remain to be discovered. The series as originally announced would have seen this installment published in October 1934. However, with documented delays the earliest month it could actually have been delivered is January 1935, and it may well have been even further delayed. The woodblock prints would have been printed during the same month as their distribution. All five of the Fan Series designs in the 128 Japanese Iris theme (including 128-2) have seal C which indicates a carving date in the period between late 1933 and the end of the first quarter of 1934. Despite the early completion of those wooden blocks, Rakusan delayed printing and distribution of the prints in this theme until the following year. Publication of the 128 Japanese Iris theme was combined with two other spring season themes nearer to the end of the series. The 36 Series design 128 has seal B which indicates a later carving period closer to the time of publication. The complicated composition of 128-2 is based around a clump of iris with an open flower and two buds. The iris stems have been beaten down by rain and are partly in the water of what is probably a pond. On one of the horizontal leaves at water level is a small frog. 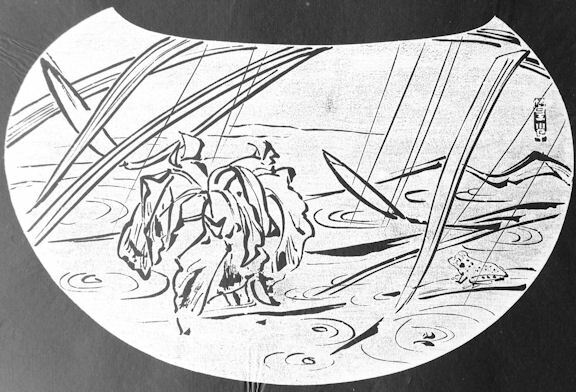 The water of the pond behind the iris is indicated by wavy lines. Around the bent stems in the foreground, rain is falling which is suggested by slanting lines and concentric ripples on the water surface. 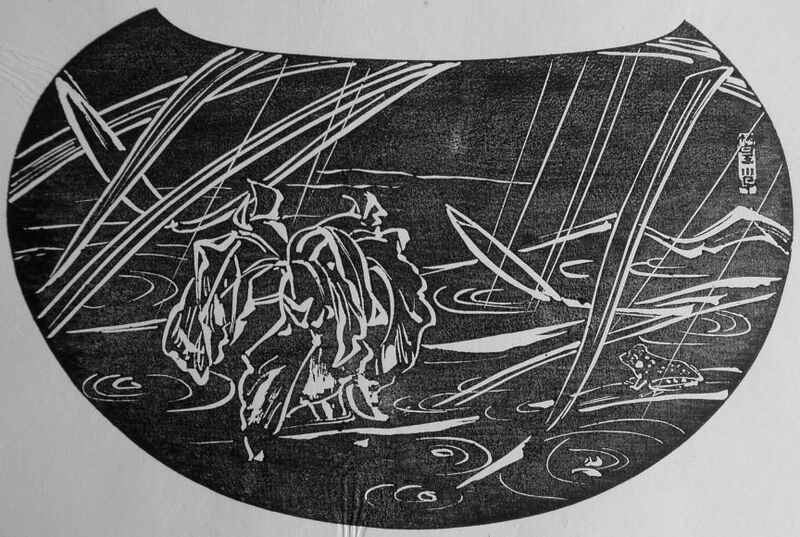 All of the fan prints in the 128 Japanese Iris theme are rendered as detailed line drawings with many interior lines within the leaves and petals. This technique works equally well as ishizuri or reversed. The general name for all frogs is 蛙, かえる, カエル, kaeru. The little frog in 128-2 may be a small specimen of Japanese Brown Frog, Rana japonica, 日本赤蛙, ニホンアカガエル, nihon aka-gaeru, lit. 'Japanese red frog', which Rakusan has used in several other artworks.